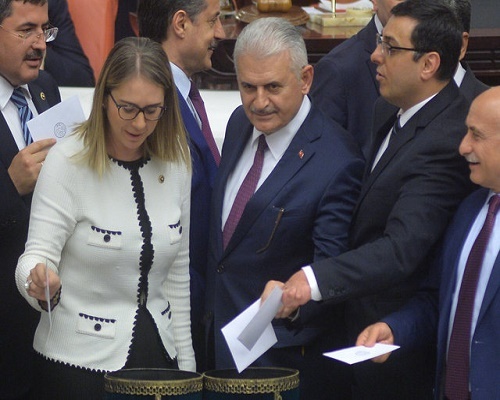 Turkish Transport Minister Binali Yildirim was announced on Thursday as the likely new leader of the ruling AK Party and therefore the next prime minister, cementing President Tayyip Erdogan’s hold on government as he seeks to extend his powers. Yildirim, a close ally of Erdogan for around two decades, will be the sole candidate for the AKP leadership at a special party congress on Sunday, AKP spokesman Omer Celik told a news conference after a meeting of the party’s executive board. The AKP, founded by Erdogan, is electing a new leader after Ahmet Davutoglu announced earlier this month he was stepping down as head of the party and therefore as prime minister following an increasingly public rift with Erdogan. “His candidacy for leadership has emerged as a result of a consultation period and through a large consensus,” Celik told a news conference in Ankara. Yildirim, a co-founder of the AKP, is seen as more likely to back Erdogan’s aim of changing the constitution to create a presidential system, a move opponents say will bring growing authoritarianism. Erdogan and his supporters see an executive presidency, akin to the system in the United States or France, as a guarantee against the fractious coalition politics that hampered the government in the 1990s. His opponents say he is merely furthering his own ambition. A new cabinet could be announced as early as Monday, AKP sources have told Reuters. Investors will be watching for any changes in the economic management team, particularly whether Deputy Prime Minister Mehmet Simsek, seen as an anchor of investor confidence, remains in office.